We are pleased to be part of the Driving Miss Daisy team. We are committed to upholding the team vision and mission to ”Accompanying You To A Fuller Life”. We welcome your inquiries. Our goal is to improve your outlook and widen your horizons. You as our clients are the most important part of our service plan. As long time Saskatoon residents we take pleasure in serving people in our great city and area. We provide assistance, accompaniment and an opportunity to maintain independence when driving is no longer an option. We provide services geared for senior citizens and or special needs by “Security cleared service providers” that possess “Clean drivers abstracts”, passenger liability are CPR/First Aid certified. 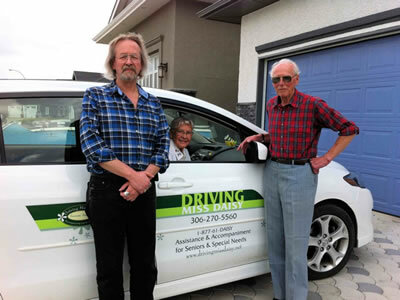 We offer friendly, safe, reliable, “through the door” transportation services for Saskatoon and area. We are walker and wheelchair friendly; you must be able to self-transfer.